Outstanding Faculty Research Award Lecture featuring Giorgi Japaridze, PhD. Tuesday, April 21 at 2:00 p.m. in the Reading Room. Dr. Japaridze will discuss the extensive research that led him to win the coveted Outstanding Faculty Research Award in 2015. Tailored for a general audience, Dr. Japaridze’s talk “Computability, Logic, and Computability Logic” will give an overview of the new line of research introduced by the speaker several years ago, named “Computability Logic.” In the same sense that traditional logic is about providing a systematic answer to the question “What is (always) true?” Computability Logic is about providing a systematic answer to the more general question “What can (always) be computed and how?” This is a long-term program for rebuilding logic into a comprehensive formal theory of computability. Light refreshments will be served. For more information, contact Regina Duffy. APA Workshop: Tuesday, April 21, 4:00 p.m., Room 207. 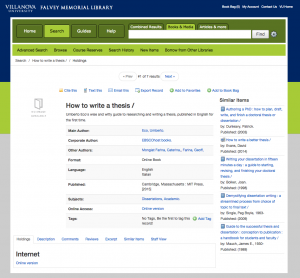 Come learn the basics of citing all types of documents: books, journal articles, and websites. Bring your laptop or Mac and get ready to show APA who’s boss! This workshop is open to students, faculty, and staff. 2015 Open Mic Poetry Reading: Wednesday, April 22, 12:00 p.m., Speakers’ Corner. Class of 2015 Creative Writing Contestants, other students and members of the University community will share original work and favorite poems, ranging from the humorous to the thought-provoking to the sublime. This event will also feature the release party of Arthology, one of Villanova University’s student art-literary magazines, which will be available to students for free. Whether you have a poem you’d like to share or just want to listen, the Department of English and Falvey Memorial Library invite you to enjoy this entertaining and memorable celebration of poetry.For more information, contact Regina Duffy. Workshop for Chicago Style Footnotes and Bibliographies: Wednesday, April 22, 4:00 p.m., Room 207. Are you confused by the different formats required by Chicago-Style for footnotes and bibliographies? Are you unsure about how and when to use “ibid.”? Answers to your questions are just around the corner. Come to Falvey Memorial Library for a quick introduction to Chicago-Style rules for footnotes and bibliographies. For more information, contact history liaison librarian Jutta Seibert. We are proud to announce the 2015 Falvey Scholars Award Winners! Falvey Memorial Library, the Center for Undergraduate Research and Fellowships, and the Honors Program are pleased to announce the 2015 Falvey Scholars Award winners: Katie Kline, Elizabeth Long, Jessica Swoboda, Nicholas Ader, Joseph Schaadt and John Szot. Falvey Scholars is an annual program that recognizes outstanding undergraduate research at Villanova. The Villanova Community is invited to join us in room 205 of Falvey Memorial Library on Friday, April 24 at 9 a.m. for the Falvey Scholars 2015 Awards Presentation and Reception Ceremony in which the award recipients will give short presentations on the content and findings of the research involved in the writing of the thesis or creation of their winning project report. A continental breakfast will be served. For more information, contact Regina Duffy. What is it? What does the internet have? It’s the new Star Wars trailer, of course. 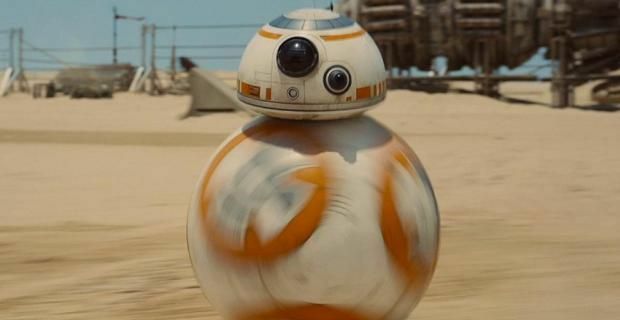 At this writing, and in less than 24 hours, over 18 million viewers have taken in the internet tease of director J.J.Abram’s brief second sneak peek into his vision of the Empire, “The Force Awakens”. Fans are poring over it for clues into the story continuation. Why are the stormtroopers wearing shiny metal instead of white? Why does the light saber have three beams? And how long do we have to wait to get a B-B8 toy in our Happy Meal!? He’s so roly-poly!! This behemoth of a book would make any Viking proud. 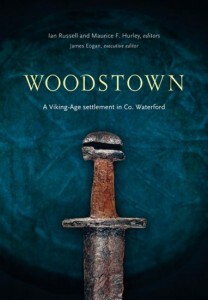 Woodstown: a Viking-Age settlement in Co. Waterford is considered “the definitive report on the archaeological excavations undertaken at the ninth-century Viking settlement at Woodstown, on the south bank of the River Suir, less than ten kilometres upstream from Waterford city’s Viking Triangle.” A weighty tome filled with detailed drawings, photographs, and charts – it’s sure to please any archaeologist. Green Press Initiative (GPI) is a non-profit program which takes a collaborative approach towards working with publishers, printers, paper manufacturers and others in the book and newspaper industries to minimize social and environmental impacts, including impacts on endangered forests, impacts on climate change, and impacts on communities where paper fiber is sourced. According to the organization, paper production requires large quantities of energy, making it the fourth largest industrial source of greenhouse gas emissions in the U.S. In commemoration of the 45th anniversary of Earth Day, celebrated this year on Wednesday, April 22, we will feature an ebook, one of hundreds of thousands available to Falvey patrons. 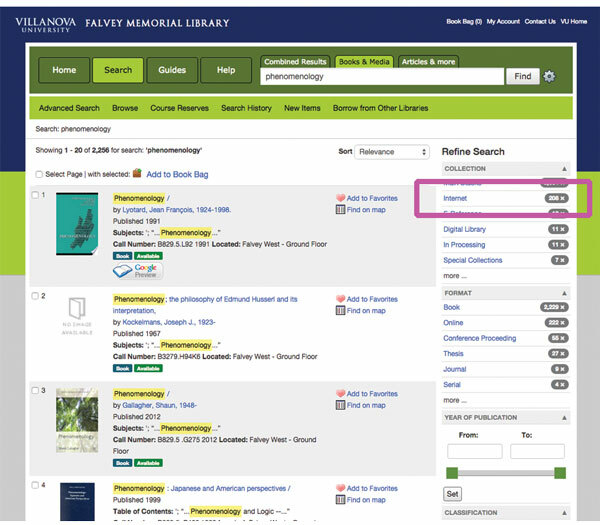 User interface, licensing polices and access vary from publisher to publisher – and we’re the first to admit that it can be confusing – so feel free to contact a librarian when you need help navigating or downloading any e-resources you find in our catalog. 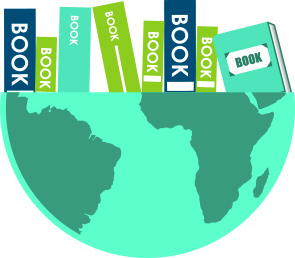 In order to access ebooks, enter your desired search terms as usual. When your results are returned, go to the “Refine Search” function in the right column, and click the “Internet” choice. This will then return only digitally accessible items. 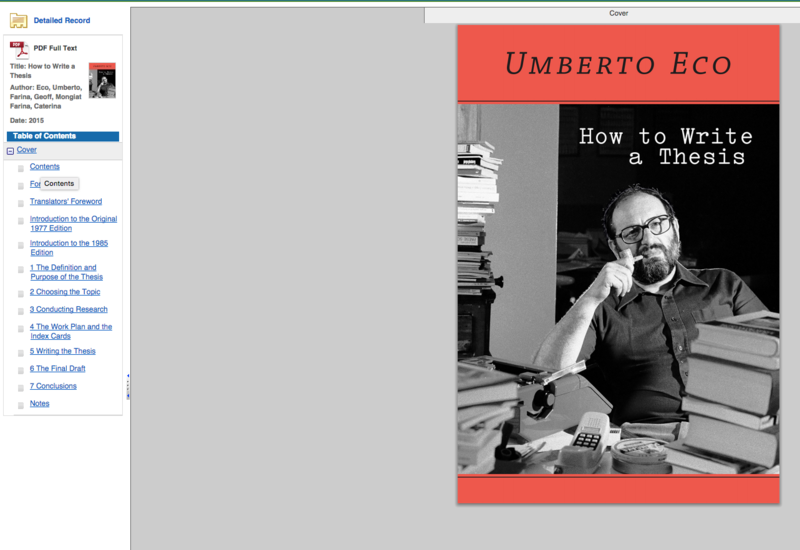 Today’s ebook is How to write a Thesis, Umberto Eco’s wise and witty guide to researching and writing a thesis, published in English for the first time.